Perhaps our country is turning a corner. A highly conservative, Republican Southern governor has done the right thing, and today vetoed an overtly unconstitutional bill to declare the "Holy Bible" Tennessee's "state book." From the start, Gov. Bill Haslam has indicated his discomfort with this bill. The Attorney General even issued a statement against it. It is just about impossible to imagine a more egregious and obvious violation of the Establishment Clause, even for this Tennessee Legislature to conjure up. Imagine if, some day as the Muslim population grows, a legislature sought to declare the Koran a state book. Or, as the secular population grows, to declare Richard Dawkins' "God Delusion" a "state book." It's equally inappropriate and coercive to endorse the Christian bible. Government may not take sides on religion. 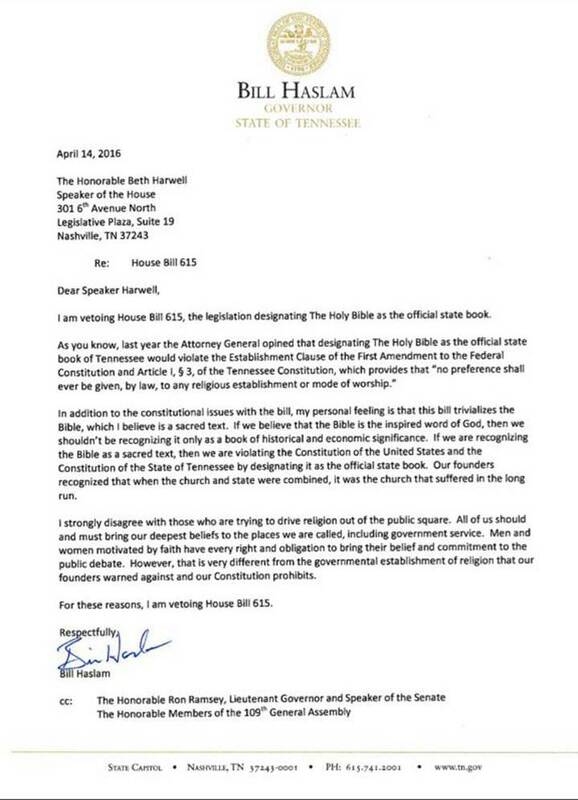 Bill Haslam not only vetoed the bill, but he issued a strong statement (below) affirming the Establishment Clause and explaining why the bill is unconstitutional. May I say, Governor, "Hallelujah!" The legislature in Tennessee can override a veto with a mere majority vote. Let's hope it listens to a voice of reason.